Kylian Mbappe reacts after a missed chance on Sunday. 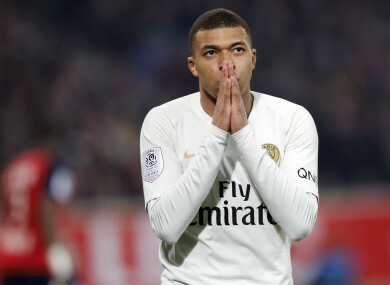 PSG MISSED THE chance to seal their sixth Ligue 1 title in seven years for the second week running on Sunday after a 5-1 hammering at second-placed Lille, their biggest league defeat in 10 years. Email “PSG title party delayed again after French champions suffer biggest defeat in 10 years”. Feedback on “PSG title party delayed again after French champions suffer biggest defeat in 10 years”.